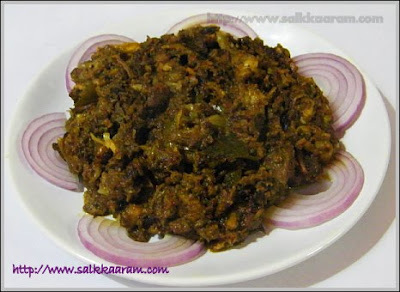 Aattirachi Varattiyathu / Dry mutton curry | Simple and Delicious ! This preparation has a medicinal value. This is usually prepared for the benefit of delivered ladies.Have heard from grand mothers that they would take different parts of mutton after delivery to regain health within the forty days of rest! When some one having anaemia or related diseases due to iron deficiency , mutton liver can be prepared using these ingredients and method. If I write about all advantages of mutton, it will go long.. This is a cumin based recipe.If you don't like, reduce the amount of cumin seeds. Grind small onions, cumin seeds, pepper corns, garlic, and ginger together. Mix with all the powders mentioned above. 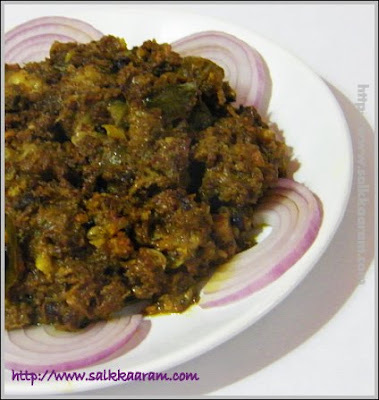 Mix mutton pieces with the above paste. Add little water for cooking. Open the lid, keep on a low flame and reduce water. When the mutton is dry, add curry leaves, slit green chilly and little coconut oil, and mix well. Pic looks so good. I prepared this and felt the cumin flavour does not at all go well with mutton. Cannot think of a non veg dish with cumin anymore. I am gonna try your other recipes for mutton now. Hey Anon, In the beginning, I have written, this recipe is usually prepared for the benefit of delivered ladies. Since Cumin helps to produce breast milk and helps to cure the uterine organs, it is taken as an important ingredient in this. For me also, don't like cumin with non veg.Thanks! Hi..i love reading your recipes and today tried the beef fry recipe..its great. Thank you. Your mutton recipe interests me because im pregnant with my first one and did not know about mutton's benefit for post-delivery.Im new here in Texas and dont have much indian friends as yet to advice me on this. Is it good to eat it while pregnant too? would you know any more such foods/recipes for pre/post delivery? i would appreciate it very much if you could let me know. Looking forward to hearing from you Seena! Thanks for the fb.Glad to know you liked it.. I tired this today.Initially I was a little skeptical about the cumin,but after it was cooked,I liked the flavor it added to the dish.By the way,i used liver for this recipe. Can i have a yummy mutton curry recipe?We are throwing a party tomorrow and i am still browsing for a good recipe.. Your blog has soooooo many recipes,i am going to try them one by one!Good Job! I have already published four mutton recipes in this blog. Pls check it in the index. Hi itha, this turned out to b delicious. Its a great pleasure to know from you.. Many thanks for this dish.I was searching exactly the same one for ages cos my granny used to make this when I was a child and I wanted to recreate it. Its simple nd interesting to read ur recipies,,im newly married nd so new to dis cooking field..ur site helps me a lott..u've dun a great job..